Home / News / When the media gets it wrong! 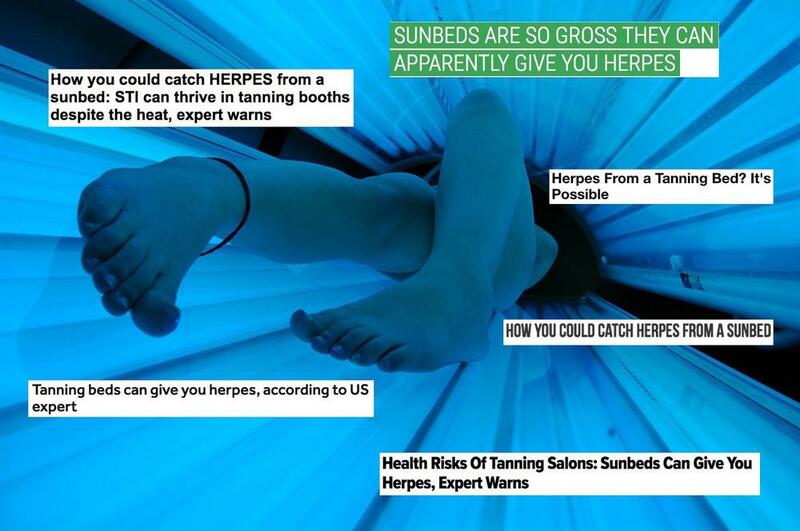 Can you get herpes from a sunbed? The papers have reported ‘herpes causes Alzheimer’s’. Err, no! The truth is that some scientists think that having various different infections including facial infection with herpes simplex contributes to the likelihood of Alzheimer’s but only if you have the APOE genotype. This explain why, when so many people have had the various infections they mention, only a small proportion develop this dementia. Quote: “We are saying there is incontrovertible evidence that Alzheimer’s Disease has a dormant microbial component. We can’t keep ignoring all of the evidence,” said Douglas Kell, a professor at the University of Manchester’s School of Chemistry and one of the authors of the editorial. Other scientists have stated they disagree with these findings! Anyway, most of us reading this blog, don’t have facial infection, do we? Most journalists know little or nothing about ‘herpes’ so we frequently see news reports that misrepresent scientific discoveries. This is particularly sad when the stories appear in publications that are written for health professionals. You might assume that specialist journalists have some knowledge of the area they cover. Sadly, this is often not the case. So, to repeat, there are nine different herpes viruses. If the story is about chickenpox or shingles (caused by human herpes virus 3), there may perhaps be no mention of ‘herpes’. Many of the other herpes viruses are not so lucky and may be simply called ‘human herpes virus 8’, for example. This makes them ripe for exploitation by stupid journalists and editors. Once upon the time The Sun carried a story captioned ‘Pope has herpes’, above a paragraph about a bout of glandular fever (human herpes virus 4). You get the picture… And as far as we know, the Pope did not have genital herpes (caused by human herpes virus 1 or 2 – these are known as the herpes simplex viruses). The latest example of this type of sloppy journalism appeared in ‘Medline Plus – Trusted health information for you’. The headline was ‘Herpes Virus Tied to Angina Risk, Study Suggests’. What did you think when you read this? It is not until the fourth paragraph that we discovered that, “The condition can develop before conception, when an egg or sperm cell becomes infected with a strain of herpes virus that causes the common childhood disease known as roseola.” Roseola (human herpes viruses 6, 6A or 7) is caught by almost everyone before the age of two. It is not ‘a strain of herpes virus’ – it is a virus in its own right and has nothing to do with the herpes simplex viruses. In the light of this, you might think that a headline like, ‘Roseola Tied to Angina Risk, Study Suggests’ might have been more accurate, but then fewer people would have read the article, because it wouldn’t have sounded so alarming – although roseola is probably even more common than herpes simplex. It would be astonishing if anyone who reads this has not had roseola. As medical knowledge increases, we hear various stories about different herpes viruses. All these viruses stay in the body and some of them may have an extra effect in some of the people who catch them. Fortunately, the viruses responsible for genital herpes and cold sores (human herpes viruses 1 and 2) hide in the nerves and infect skin cells. They are extremely unlikely to do any more than this, so if we are going to worry about ‘herpes’, it is the other human herpes viruses, like roseola, that we should be paying more attention to. They deserve their own day out in the public glare. So please let’s leave ‘herpes’ out of the headlines, unless it is herpes simplex we are talking about. Dr Anthony Epstein (along with Mr Barr) found EBV. This virus is HHV4 – humanherpes [that’s the correct spelling] virus number 4. To celebrate this, Keble College, Oxford will have a conference in March 2014. EBV is very different from HSV1 and HSV2, which are herpes simplex types 1 and 2. EBV does not cause any blisters/spots on the skin, but instead causes glandular fever – an illness that affects the whole body. It is passed on in saliva, so it has been nicknamed ‘the kissing disease’. It is extremely common, and there is no average frequency of recurrences, which most often just give the affected person a day or two of malaise. See their flyer for the event.